Closest lodge to Monteverde Cloudforest Reserve. Gardens filled with orchids and trees. A garden dedicated to attracting hummingbirds. Good location for bird watching. Spacious, en-suite rooms with forest views. 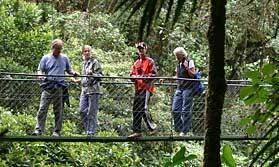 The Trapp Family Lodge is the closest lodge to the popular Monteverde Reserve, with its pristine cloud forest, varied wildlife, walking trails and canopy walkways. You can be assured of a warm welcome from the Trapp family and staff are happy to advise on favourite activities in the area. The lodge is set in pretty gardens adjoining lush rainforest and is just a 15 minute walk from Monteverde forest trails. Guest accommodation is in comfy wooden chalets, all with 2 queen size beds, telephone, TV, an en-suite bathroom with hot and cold running water and hairdryer, and views of either the gardens or the forest, perfect for a good nights rest. The lodge's private reserve cloud forest is like a mini Monteverde, with plentiful bird and mammal life. With the main reserve less than 2 kms away, you can soon be enjoying encounters with some of the 400 species of birds, which will hopefully include the resplendent quetzal, Capuchin and howler monkeys, sloths, tapir and cats. This is also a haven for reptiles and amphibians so be on the lookout for those too. There's a special garden dedicated to hummingbirds a short walk from the lodge, it's a wonderful place to spend some time. Open: The family friendly Trapp Family Lodge is open all year round. Location: This is the closest hotel to the Monteverde Cloudforest Reserve. Rooms: There are 20 rooms, and 8 suites. All are spacious, have 2 queen size beds, a telephone, hairdryer, safe, and an en-suite bathroom with hot and cold water. They are decorated with local artworks giving them a homely vibe. Each of the rooms has a floor to ceiling window overlooking the gardens, while the suites have balconies with views of the mountain and forest, plus additional facilities including a TV and fridge. 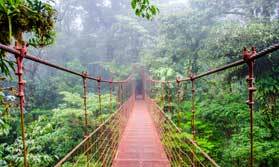 Activities: You can enjoy self-guided trails in the gardens, nature tours in the Monteverde Cloudforest Reserve, visit the hummingbird garden, take nighttime walks and also venture into Santa Elena itself, a short drive away where there are various attractions that you can enjoy. Facilities: The lodge has a restaurant and lounge/bar. There is also an outdoor dining terrace overlooking the established and beautiful gardens. The private forest reserve has marked walking trails that you can explore at your leisure. Communication: WiFi is available in all the communal areas. "Staff were good. Only downside was the room in the basement was quite cold. With not a great view. But facilities and everything else was great. Bit gutted the Postcards we have reception to post haven't landed 4 weeks on ? Great hotel to base yourself and explore Monteverde." "Very good accommodation. Excellent location for exploring the Cloud forest reserve. 2 Km from the town so a taxi or bus to get there for evening entertainment ie bars and restaurants." "High up in the cloud forest, it was within walking distance of the national park but isolated from anywhere else without a taxi ride. It was very windy and there's no double glazing (I wouldn't expect it) which meant we didn't sleep very well at all as cold and noisy. The restaurant meals were excellent but we found the breakfasts, served in a different room to be very basic and not much variety." "Comfortable rooms, hot shower and brilliant Lemon grass body lotion which also an insect repellent - very close to the entrance to the national park. Not surprisingly the Cloud Forest is very wet and quite chilly, the hotel provided us with a portable heater. We used this as a base, leaving early in the morning and getting back in the evening. " "Very efficient service, but the hotel lacked warmth"